Driving on gravel roads can be hard on your vehicle and definitely tough on your tires. It doesn’t matter whether you are driving a truck or Jeep, the blunt, coarse rocks can tear, cut, or chew through your tires. That’s why it’s important to choose the kind of tire that can handle the rigors and pressures of off-road driving. Fortunately, there are many tires on the market that can help you ply gravel/muddy roads and can be a lifesaver if you live in the countryside or frequent there. And the best gravel tires are those that help you maintain comfort and close to normal driving experience on a paved road when you drive on gravel roads. In this article, you’ll learn what to consider when selecting tires for gravel roads and the top 5 models to choose from. There are quite a few factors to keep in mind when choosing tires for rough surfaces. You don’t just have to choose a strong tire but also one that can handle the complexity of gravel roads. And don’t forget that the tires you choose for your car can have a great impact on how stressful or smoothly your ride is. 1.Determine the ratio of on vs off road use. In order to choose the right tire for your vehicle, you have to determine how much you’ll be using it off and on the road. If you intend to only use your tires for off-roading, you’ll need to look for those with aggressive tread and wider tread pattern. All-terrain tires are the most common in use for this purpose as they come with aggressive tread patterns that go all the way up to the sidewalls. They also have smaller tread blocks and thinner grooves in the center which helps with good traction on rough roads. However, you don’t necessarily need to set your eyes on only this type as there are others out there you can try. As long as they fulfill these other requirements below, you are good to go. 2. Choose tires that can handle harsh conditions on gravel roads. These types of tires will be able to move through asphalt, gravel routes as well as other rough and hard surfaces. They are specifically designed to withstand accidental impact with their strong interior structure and strengthened sidewalls. 3. Look for tires that have flat tread profile and sharp edges. These tires have great directional and lateral grip and can travel gravel surfaces, thanks to their flat and sharp edges. They also have radial dowels, which is great for good traction on soft ground. In addition, they feature special lateral reinforcement, which protects them from damages caused by road impacts. 4. The tires should be well constructed and sturdy. To successfully drive in the countryside roads, your tires need to have tougher sidewalls and protection as well as better tread life on and off road. Aggressive all-terrain traction is also sometimes required, meaning a tire you can use in winter and summer with good traction. 5. Keep the tire pressure low. When the pressure is low, the tire softens and that the tire to grab gravel better. You can achieve this by keeping the tire pressure below the recommended standard level when you are driving on gravel roads. In essence, if you only want to use your vehicle for tough off-road, with no on-road applications, choose an all-terrain or mud-terrain tire – the all-terrain being the toughest of the two. 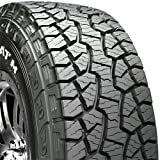 These tires have stiffer sidewalls for resisting puncture when traveling off-road and wider spacing in the tread pattern to remove mud from the tread. They are highly recommended for limited on road driving. If you want a balanced performance between off and on-road usage, you can choose a trail, mud-terrain, or all-terrain tire – in that order. CoreGard Technology: Tougher Sidewall Rubber: Split & bruise resistant sidewall rubber, derived from BFGoodrich's race proven Baja T/AKR2 tire. Thicker, Extended Shoulder Rubber: Increased rubber thickness, extending down the sidewall to protect more of the critical sidewall failure zone. Advanced Deflection Design: Computer predicted object path design deflects protruding objects from snagging & splitting the sidewall. Upper Sidewall Traction Bars: Protruding sidewall rubber blocks that provide increased mud, snow & rock traction, especially in aired-down driving situations. Mud-Phobic Bars: Raised bars in the shoulder tread area that helps to release compacted mud for enhanced traction in muddy and soft soil conditions. Serrated Shoulder Design: Staggered shoulder blocks that provide greater maneuverability in soft soil and deep snow conditions. Locking 3-D Sipes: 3-D active sipe technology, that provides more biting edges for significantly increased snow traction. 3 Peak Mountain Snowflake: Exceeds Rubber Manufacturer Association (RMA) Severe Snow Traction requirements. The BFGoodrich All-Terrain T/A KO2 features 20% tougher sidewalls compared to the previous model, which translates into better road resistance and longer lifespan. The tire boasts of longer tread life on and off road with aggressive all-terrain traction, all great for trudging your car through tough grit. The tire features Coregard technology, which includes tougher sidewall rubber, split and bruise resistant compound for maintaining traction on gravel roads. The shoulder rubber is thicker and extends farther down the shoulder to protect the tire from a critical sidewall failure zone. Unlike the previous model, which has vertical lines in the tread, there is a little bit of a slant in the design of the KO2, which means stronger sidewall and thickness that translates to better grip in sand and mud conditions. Tires without a dedicated technology for protecting the sidewall don’t last as long as this because they are not flexible and can easily be affected by objects on the road. Coregard Technology, on the other hand, allows the KO2 to be flexible enough to resist sidewall failure and minimize road impact. The advanced deflection design on the tire deflects protruding objects, which are plenty on gravel roads. The tire can resist snags and sidewall splitting too, so you can travel long distance without touching on paved roads. In addition, the tire comes with advanced footprint shape that distributes stress more evenly, providing a longer, more uniform wear. An interlocking tread design ensures increased tread block stability and better wear over the long haul. Stone ejectors are situated throughout the tire to protect against stone drilling and to minimize stone retention and let you move fast against gravel filled path. The tire has mud-phobic bars, with raised bars in the shoulder tread area to release compacted mud from the tread and enhance traction in mud and soft soils. Plus the serrated shoulder design and staggered shoulder blocks allow for greater traction in soft soil. Finally, the tire has locking 3-D sipes technology for more biting edges and a significant increase in snow traction. With 3-peak mountain snowflake, the tire exceeds RMA severe snow requirements, which means it can provide equal traction on snow as dedicated winter tires. The sipes have zigzags so that the tire can go over dirt and rough terrain with a better lock, giving you better traction than the previous model. A lot of four-wheel drive enthusiasts tend to want the biggest chunky-built, gnarliest off-road tire they can put on their four-wheel drive, purely for the looks. The reality is they’re not really practical in day-to-day driving. An all-terrain as the name suggests is made to go anywhere. It’ll cover all sorts of terrain and any sort of ground you want to drive over. An all-terrain tire has a nice blend between having on-road capabilities and off-road capabilities so you can swing all the way to a highway tire or all the way to a mud trail. And Falken tires has recently updated its Wildpeak AT3W All Terrain Tire to a new design. The tire features a new silica compound to improve its all-round performance. Some of the other features of this new design include 3D sipes, which lock the tread blocks together for better handling and better grip in the wet as well as better performance all round. Also, you’ll see on the the tire that it has the raised edges on the sidewall to protect against stone damage. The heavy-duty construction is to protect against punches and it’s what you want for a combination of on and off-road driving. For driving on the highway, they’re nice and quiet, smooth and predictable if you’re good in braking. And then, when you get out on the tracks, drop your tire pressure down a little bit and they can cope through the gravel really well. The siping is placed all the way through all the big locks and what that does is that when you have this tire down off-road, it’s going to flex and bend and give you great footprint on your terrain, which translates into great traction. The tread blocks on the tire are bulkier and thicker with some larger gaps and siping in them. It’s very tight-knit and smooth but with the extra bulkiness along the sidewalls on the top to provide extra traction offroad. When you compare this tire to a mud terrain, you may notice that some of the siping and the way the blocks are cut are less aggressive than you’d get on a tire like the Fulkan Wildpeak Mt or the BFG KM2 or KM3. Those are going to have bigger locks and more aggressive and they obviously provide an advantage in the mud and the soft area but you’re going to have to sacrifice a lot of comfort on the road as far as sound is concerned and just overall ride comfort. So the all terrain is a lot better because they offer that happy medium where you get the capability you need but you are not sacrificing much in the way of comfort. The Discoverer STT Pro is one of the most aggressive tires that Cooper has ever made. Although they are clearly ready for off-road use, the brand did spend some time making sure that they’re ready for the highway too. For strength, a process known as Armored Tech 3 provides 50% more protection against impact damage than a standard 2-ply tire. What that really means is that the third-ply of this tire is married to the other two on a small angle to provide additional puncture protection. Also helping off-road driving are the side biters at the shoulder of the tire along with the asymmetrical scallops on the alternating lug. What this means is that those small scallops help to direct the mud into the mud scoops, which maximizes your bite off the tire. There is a lot more technology on this tire for off-road, but there are also a few things worth mentioning about what Cooper did for the highway/pavement driving. On the lower end corner of the tire, some flex grooves are placed to help the tread flex a little bit so it can eat up road imperfections, whether it’s a pothole or just broken pavement. The tire also has alternating spread ribs that go from 3 to 2 and is available on most all terrain tires. This is done to try to keep the tire quiet on the pavement even though that only works to a manageable level. So if you are going to buy this, you should be prepared to live with some noise while traveling on road. Mud ejection is where this type of tire shines. Similar to tires like the Super Wamper, Pro Comp MT2, Krawler T/A KX, it’s important to remember that higher wheel speeds are what ejects the mud. So, if you find mud packing into the drive wheels, increase the wheel speed to increase mud ejection. High-void tread design with larger footprint, interlocking tread elements and advanced compounding. The BFGoodrich Mud-Terrain T/A All-Terrain Tire is for those of you that have a 1987 Wrangler all the way through the most current model. 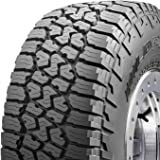 If you are looking for a high-quality all-terrain tire that comes in sizes from 29 to 35 inches and four-wheel sizes of 15 to 20 inches, you have a lot of options with this. What separates this tire from the others is its extreme aggressiveness and the big lugs with large spaces in between them. All these allow for a really good grip on both rocks and in the mud when you are off-road and also the ability of the tire to self-clean. That means that if you give your Jeep a little bit more gas, it’s going to fling the mud out of the tires, clearing everything up and giving you back your bite. One thing you can’t do with this tire is to drive it on pavement too often because if you do, you’re are going to hear a bit more tire noise and you’ll get less life out of the tire. This is a trade-off you can’t avoid if you go with a very aggressive monster like this on your Jeep. One advantage of this tire is that it has a lot of flex so you can have a good grip on gravel. The tire is going to conform around whatever obstacle you are driving over and give you a great amount of surface contact and therefore a ton of traction. The shoulder and sidewall of the tire are very beefy and the 3 ply sidewall provides a good dose of puncture resistance. This tire comes with a specialty compound and a reinforced under-tread gauge that helps in preventing internal damage from impacts sustained when off the road. If you travel off-road a lot, the tires are definitely going to see a lot of road impacts. And without a proper tread reinforcement, the sidewall may fail or the tire may burst along the way, so this is a handy feature to have. In addition, there is an inner liner that suports the rubber thickness to minimize the damage from off-road impact with improved hill climbing and steering stability on both on and off the road. The tire also has nylon-reinforced belts underneath to reinforce the belt durability as well as high-strength belts for improved steering stability and durability. And another mechanism prevents bead separation when driving off-road on low air conditions. A deeper look at the tire exposes a rugged puncture resistance on the shoulder of the tire. This is where the wraparound tread on the tire provides not only a rugged look but protection against cuts, bruises, and impact breaks. This affords you outstanding traction especially when you are driving in snowy or muddy condition. Slightly above the shoulder is the waved kerf which comprises deep two-step sipes that extend the tread life and increase performance on wet roads. One of the bigger investments that you make on your vehicle that contributes both to the performance and safety of your vehicle is getting new tires. When it comes the time to buy tires, you want to do your research and figure out what you like and what’s a good quality tire. That way, you can get your money’s worth. After comparing the best gravel tires on the market, we’ve settled on the top 5 in this guide. And out of these, the BFGoodrich All-terrain Tire is the most suitable tire for gravel road driving. 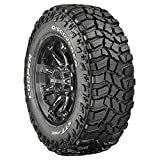 The BFGoodrich All-Terrain T/A KO2 features specially formulated tread rubber, which is optimally blended to reduce chips and tears that occur frequently with tires traveling on gravel. Traveling 1000 miles on severe gravel can leave your tire chipped out and worn quickly, but thanks to the highly optimized tread rubber, this tire will provide you with superior gravel road endurance as well as 15% longer tread life on asphalt.